Seattle builder Wells (or Wellsley) Gwinn was born in Sydney, Nova Scotia, Canada in 1878. He began working construction there with his father at an early age. After immigrating to the United States in 1901, he married Ms. Isabelle Thomson in Boston. Around 1903 Wells moved with his wife and two young children to Seattle. At the time, the city was on the cusp of a big building booming, ripe conditions for a young entrepreneur with marketable skills. Gwinn’s family tree had been rooted with builders for several generations back, and he and his siblings were destined to continue in the family business. 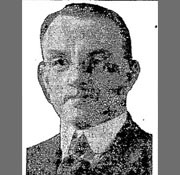 His younger brother, Gardner J. who arrived in Seattle a few years later, would create a vey successful competing construction business in Seattle. And his other brother, George W., became a prominent painter in the community. According to the 1910 census Wells began his career as a plumber. However by the mid to late teens he was serving as a general contractor and began heavily marketing his business in the Seattle Times. His company motto was: “The Maximum House at the Minimal Cost” and "Distinctive, Different, Charming." Many featured articles in the Seattle Times during the 1920s highlighted Wells Gwinn homes, which ranged in design from simple Craftsman Bungalows and ornate Colonial Revival dwellings to Period Revivals and Dutch Colonial abodes. While not a prolific as his younger brother, Wells Gwinn advertising prowess did equal that of his brother. Known projects are scattered throughout the city of Seattle. They include homes at 2371 Franklin Ave E (1922, demolished); 2369 Franklin Ave E (1922, demolished); 4521 Latona Ave NE (1922); 2015 33rd Ave S (1922); 1927 Calhoun St (1922); 8 lots in the Montlake neighborhood on 20th between Lynn & Calhoun; several dwellings in the Mount Baker Park Addition; and the Earl Staley House (2610 E Interlaken Blvd, 1924). Later he also developed the Wellesley Apartments (1925) at Brooklyn & 42nd Ave. While Gwinn was not a licensed architect, he did advertise his firm’s designer services. Per newspaper articles he used an in-house architect to work out plans and building estimates. He also purchased plans from outside architects, such as Edward L. Merritt and shared many designs with this younger brother, Gardner. Eventually pulling back from active engagement in the construction business for over 25 years, he became involved in the finance business. By 1939 had become manager of the Acme Finance Company and eventually lead the company as president. Wells was active in the Central Lions Club and served at various times as President of the Phinney Avenue Improvement Club. He was also an active member of the First Nazarene Church, and served as Secretary of the Seattle Home Builders Association (1924). Over the course of his career Wells also became involved in the Seattle Pacific College and served as a Trustee for 30+ years (1915-1947); including 12 years as chairman of the board and 25 years as chairman of the executive board. To honor his long service, the school named the dinning hall after Gwinn in 1962: Gwinn Commons. Wells retired in 1946 and passed away in Seattle on March 21, 1963 at the age of 85 and is buried at the Washelli Cemetery. “Wells Gwinn Will Honor Golden Jubilee” – Seattle Times: October 26, 1952. “Wellsley Gwinn Funeral to be Monday at 1” – Seattle Times: March 22, 1963. Obituary: “Mrs. Wells Gwinn” – Seattle Times: January 4, 1954. Obituary: “Gwinn - Wells” – Seattle Times: March 24, 1963. “Seattle Pacific to Honor 2” – Seattle Times: October 13, 1960. “School Honors Cyril D. Hill” – Seattle Times: April 15, 1962. “Seattle Pacific Will Dedicate 3 Buildings” – Seattle Times: October 25, 1962. Advertisement: “The Maximum House at the Minimum Cost” – Seattle Times: March 20, 1922. “W. Gwinn Builds Home” – Seattle Times: March 27, 1922. “Seven Houses Sold” – Seattle Times: Sep 10, 1922. “W. Gwinn, 7421 Fourth Avenue …..” – Seattle Times: October 25, 1908. “Isabelle Gwinn has sold the northwest triple…..” – Seattle Times: June 23, 1907. “Wells Gwinn took up his telephone…..” – Seattle Times: November 28, 1939. Advertisement: “United Y.M.C.A. Schools” – Seattle Times: October 22, 1922. “Plans Eight New Homes” – Seattle Times: October 29, 1922. “Opposes Restrictions” – Seattle Times: April 27, 1924. “Y.M.C.A. Classes to Debate City Manager Tonight” – Seattle Times: January 29, 1926. “Incorporations: Olympic Holding Co.” – Seattle Times: August 15, 1930. “Goodwill Calendar” – Seattle Times: September 22, 1935. “Seattle Pacific College Board To Sit Wednesday” – Seattle Times: March 8, 1936. “Campus Ground To Be Broken” – Seattle Times: March 7, 1939. “Another Year-in-and-year-out contributor….” Seattle Times: November 29, 1940. Obituary: “George W. Gwinn” – Seattle Times: June 30, 1944. “Planning for the Homes” – Keith Magazine on Home Building: December 1921. Advertisement: “Distinct Different Charming” – Seattle Times: April 20, 1924. Real Estate Advertisement: “Interlaken: Wonderful View Bungalow” – Seattle Times: July 15, 1923. “Type Pleases Family” – Seattle Times: May 28, 1923. “Plan is Economical” – Seattle Times: May 7, 1923. “One Floor Popular” – Seattle Times: April 16, 1923. “New Features Added” – Seattle Times: March 26, 1923. “Has Colonial Effect” – Seattle Times: June 26, 1922. “Bungalow Has Appeal” – Seattle Times: February 27, 1922. “Has Built-in Garage” – Seattle Times: March 12, 1923. “Comfort in Homes” – Seattle Times: February 12, 1923. “Low Priced But Cozy” – Seattle Times: May1, 1922. “New Apartments in University District” – Seattle Times: September 18, 1925.